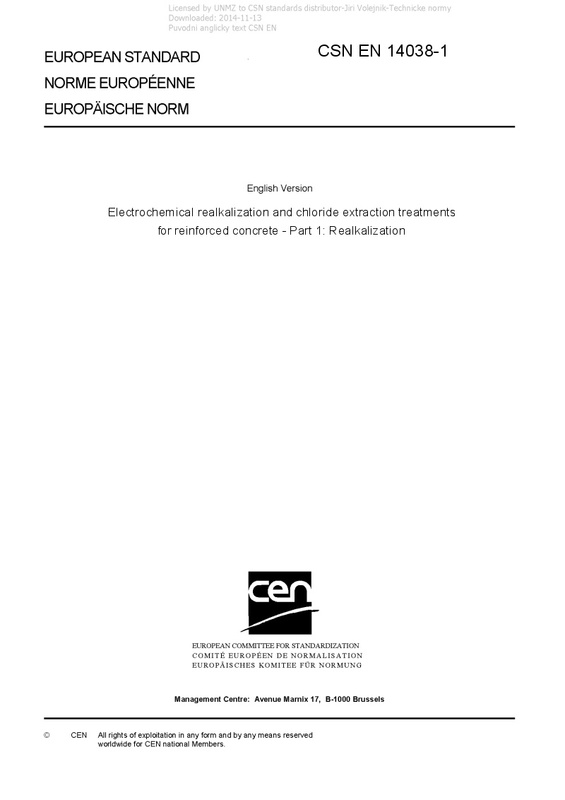 EN 14038-1 Electrochemical realkalization and chloride extraction treatments for reinforced concrete - Part 1: Realkalization - This European Standard specifies a procedure for carrying out impressed current electrochemical realkalization (ER) of carbonated reinforced concrete in existing structures. It is applicable to atmospherically exposed parts of structures with ordinary reinforcement embedded in concrete. This European Standard does not apply to concrete containing prestressing steel which can suffer hydrogen embrittlement during realkalization, or to concrete containing epoxy-coated or galvanized reinforcement, or if chloride contamination is contributing to reinforcement corrosion. NOTE In case of post-tensioned prestressing concrete, the endangered tendon strands may be shielded by the tendon ducts from unwanted and/ or exceeded polarization into the cathodic range and respective water reduction.